Consider this your palate's passport to a myriad of culinary splendors. WIN Signature Restaurants offers a modern twist for those who hunger a multi-cultural tapestry of beautifully creative contemporary Asian cuisines with global influences ranging from France to Italy and beyond. Every plate achieves that elusive, cuisine-defining balance of sweet, salty, sour and umami. At WIN Signature restaurants we are passionate about creating the perfect dining experience for any occasion. Our team goes beyond to produce great dishes accompanied by exceptional service. Our family of restaurants feature contemporary Asian dishes with global influences and complemented by an expansive sushi selection. Our menus highlight the freshest fish that Corporate Chef Kaz Mitsui and his team is able to source from around the world. He takes great care in his technique and ingredients; expertly carving the fish, selecting quality ingredients and offering homemade soy sauce. For the guests desiring something other than sushi, the menu also features a variety of options such as A5 Waygu Beef and our classic Kobe Beef Cheesesteak. Land & sea, our WIN signature dishes create an adventure for your palate. We are also proud to offer a curated list of wines, beers and exotic cocktails. Stay tuned for special wine dinner events and cigar & whisky nights. In addition, outdoor dining on our rooftop at Azie Media and the patio spaces at Teikoku and Azie on Main, makes them the place to be this summer. From our family to yours, we look forward to seeing you soon! When Chef Koichi Aoyama was a young boy growing up in Tokyo, he did not know he would one day be named the best Japanese Chef in Philadelphia by Philadelphia Magazine. Chef Aoyama says what he enjoys most about his job is being creative. While he tries to adhere to the traditional Japanese style, he adds his own flair. "Sometimes I like to conflict them or confuse them." He values quality ingredients and prepares dishes as if it were only for you. "Ken" is the Executive Chef at Teikoku and has had over 15 years of experience.. His love of cooking began since the age of 10 when his grandmother and father would bring him to be a helper in the kitchen almost every day after school. He then travelled to Sydney, Australia and enrolled in culinary school. His speciality is modern Thai cuisine and Asian fusion. In the kitchen his always is experimenting saying that "it is fun to create something new every day to eat". Chef Tai has been part of the Mikado Thai Pepper family for the last 20 years. He creates incredibly diverse menus that ranges from delicate sashimi cuts, to creative nigiri bites and maki rolls. Sushi aficionados will appreciate his perfected technique, the variety of specialty rolls that are offered and the deliciousness of fresh sashimi his is able to source from around the world. Chef Lukito first was introduced to sushi under the tutelage of Ige-san at Teikoku in West Chester. After stints in NYC, Chef Agus returned back to Philadelphia and became Executive Sushi Chef at Mikado and also participated in the Chef in Residence Program at Mango Moon with both Moon and Ige-san. Since then he has rejoined the WSR company and has become Executive Sous Chef at Teikoku creating spectacular sushi dishes and honing his culinary skills. Chef Takashima was born in the Aichi Prefecture, Japan and joined Japan’s Self Defense Force (SDF) before beginning a career as a Sushi Chef. In 1983 he arrived in the U.S. and started work at the acclaimed Genji Restaurant in Philadelphia before joining Win Signature Restaurants in 2007 at Teikoku. Chef Ricardo Franco brings a lot to the party. Franco is a native of Brazil with a cornucopia of insight from his previous experiences of being a restaurantaur himself. His center of culinary gravity is contemporary Asian cuisines, with vibrant and bold touches from France to Italy. He continues to expand the breadth of Azie on Main’s menu with a series of special wine dinners designed to explore the culinary richness of the world. "Mingo” as he is fondly known around the kitchen, came to United States from Seoul, Korea for a sushi apprenticeship in Wasington D.C. He came to Azie in 2011 and worked under Chef Kazuyuki Mitsui, as a sushi chef . Here working with Chef Kaz he refined his skills in the sushi bar and in addition became enamored with kitchen food. Mingo diligently worked hard and became Chef De Cuisine of Azie Media. After a recent stint out west in Colorado, Mingo came back to Win Signature Restaurants and joined our team at Teikoku. Mingo has brought us new and interesting dishes with immaculate presentation. Chef Gato was born in Honduras and began working at Win Signature Restaurants in 2010. He learned about Japanese cooking and honed his craft at Thai Pepper Mikado under Chef "Thai". In 2013 he started working under Chef Kaz and is now an Executive Chef at Azie in Media. For more than two decades, this husband-wife duo has been a culinary powerhouse on the Main Line. 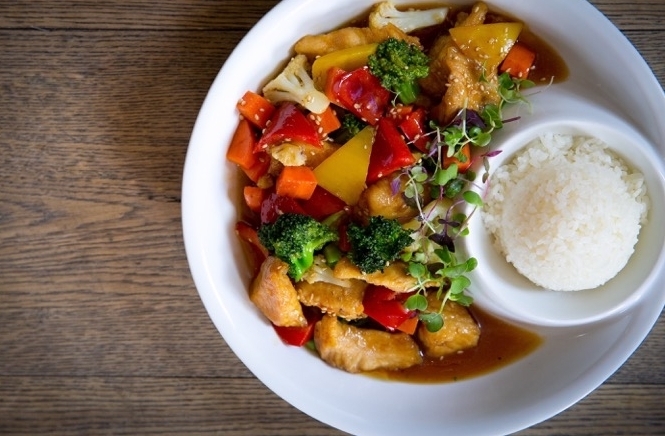 While each WIN Signature Restaurant embraces individuality by showcasing its respective regional cuisine, they all share universal ideals: fresh ingredients, a creative Asian-fusion menu, cosmopolitan décor, exceptional service, and a chic clientele. And just like the menu, the partnership between Win and Sutida continues to evolve.